Surbhi did her schooling from Wynberg Allen, Mussourie. She thereafter, attained a Bachelors degree in Journalism & Mass Communication from Amity University, Greater Noida. She then worked for a leading events designing company called Q Events. 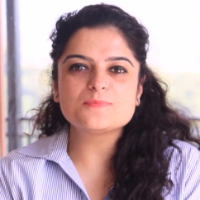 She is presently the Head Resident Engagement at Antara Senior Living, Dehradun. Community Engagement Management entails ensuring that all the promised services are rightly delivered to the residents of a community. Senior living is a concept that is more popular in the west however, the same has recently been tapped by the Max India Group who has started Antara Senior Living in Dehradun, India. "I did my schooling from Wynberg Allen, Mussourie. I thereafter, attained a Bachelors degree in Journalism & Mass Communication from Amity University, Greater Noida. I then worked for a leading events designing company called Q Events. I am presently the Head Resident Engagement at Antara Senior Living, Dehradun."